AmeriCool lineup drives continued growth as they enter their fifth year in the North American market. 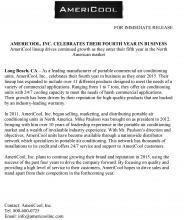 As a leading manufacturer of portable commercial air conditioning units, AmeriCool, LLC., celebrates their fourth year in business as they enter 2015. Their lineup has expanded to include over 11 different products designed to meet the needs of a variety of commercial applications. Did you know that a massive computer room air conditioning unit may not be the most effective way to cool your data center or server room? Pushing large volumes of chilled air into into a massive room is not only expensive, but it can be inefficient and wasteful. Rather than cooling a unit directly, all of the excess air around the server is chilled, thus adding to the overall cost and time it takes to cool the unit itself. Our Industry-Leading Warranty for Your AC: Maybe you are on the market for your first commercial portable air conditioner, and you’ve narrowed down your choice between several different brands. Or perhaps you are trying to replace your previous set of portable air cooling units after they died prematurely due to a manufacturing defect. If that’s the case, you have already learned the importance of shopping for the best available warranty, in addition to the best features and lowest price. With so many commercial portable air conditioners on the market today, it can become overwhelming to try and pin down what features you need to shop for to cool your data center. 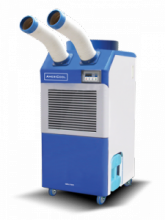 Luckily, the portable units from AmeriCool come standard with many flexible features that will meet the needs of almost any application requirement. AmeriCool, LLC. 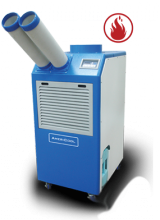 's portable ac unit lineup includes the WPC-9000, a self contained 37,000 BTU/h unit. This unit is designed to run 24/7 and is great for computer room cooling as well as high humidity/high temperature applications. The unit features a 16" exhaust duct flange, 5'x20" cool air duct assembly, vinyl chloride evaporator filter, aluminum condenser filter and a condensate tank. It also includes an industry-leading 1 year warranty on the entire unit, with a 3 year warranty on the compressor, both of which include parts and labor. Every cooling situation is different. Some data centers have limited floor space. 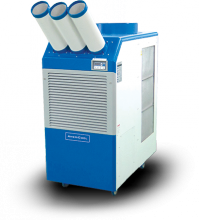 Some locations need heating and cooling, while others need more cooling capacity in one portable unit. Read this recent article about the AmeriCool, LLC. 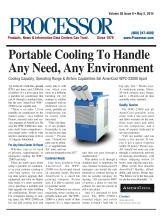 WPC-23000, a portable data center air conditioner, which was featured on the cover of Processor in May 2014. We are thoroughly excited about the press. AmeriCool, LLC. 's Portable Air Conditioner unit lineup now includes the WPC-23000, a 92,000 Btu/h unit that is ideal for computer room cooling. 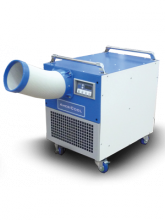 The WPC-23000 includes features such as an operating range of 64-113 degrees, as well as the ability to replace cold air nozzles with included grill. With much of the US still in a state of freezing temperatures, AmeriCool, LLC. 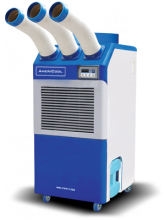 now features the WPH-4000 (Heat Pump). It’s an impressive addition to the commercial portable air conditioner line-up and offers the best of both worlds. At 115V it features 16,800 Btu/h Cooling Capacity and 18,500 Btu/h Heating Capacity. 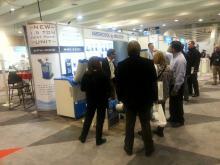 Despite a storm that dropped 10 inches of snow on New York City and created a state of emergency in parts of New York, the severe weather couldn’t stop tens of thousands of determined attendees and exhibitors from filling the aisles and booths at the 2014 AHR Expo held at the Javits Convention Center in NYC, January 21 through 23.